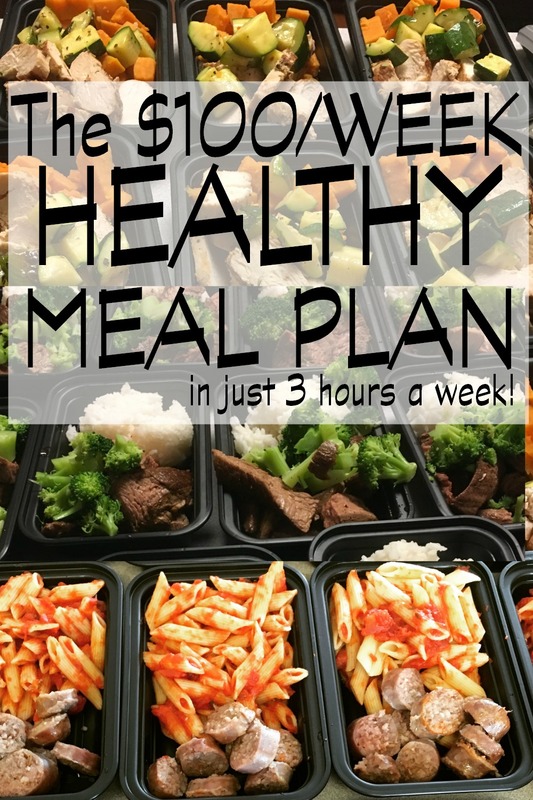 If you’re looking for a super healthy meal plan, a way to put lunches and dinners on autopilot, then I’m about to blow your mind. 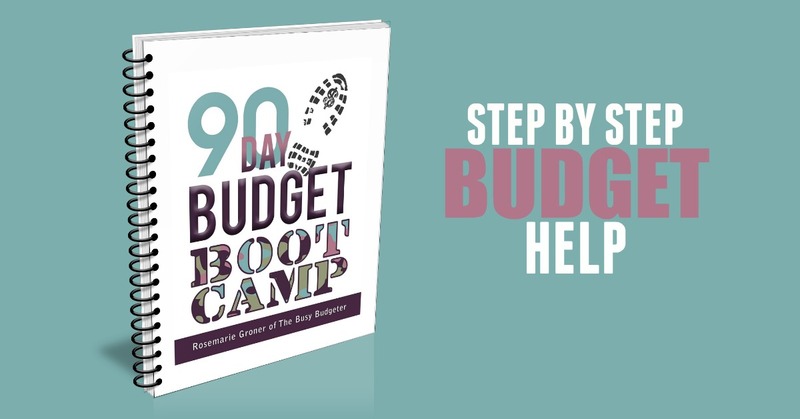 Update: You can now join the 90 Day Budget Boot Camp for free! Get step by step instructions for how to set up a budget, maintain a budget, and save money. With hundreds of success stories and reviews, this is not an opportunity you want to miss! Join the Budget Boot Camp here. 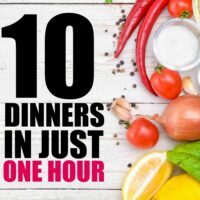 I’m going to show you how to spend 4 hours this weekend to make 74 pre-portioned healthy TV dinners using whole foods that can be frozen and thawed as needed. These are perfect to bring for lunch (and you can even toss the container when you’re done!) and super frugal! To feed our family of 4, we’re spending less than $100/week (including the cost of the containers and condiments!) on this program. We’re losing weight and eating a ton of vegetables, and I’ve spent no time cooking at all since we started. Each meal can be microwaved for 90 seconds (if it’s thawed) or on 50% power for 90 seconds and then 90 seconds on full power if it’s frozen. First off, you should know that we’re practicing what we preach. We’ve been eating nothing but the meals I’m about to tell you about for a month and a half now. Our pantry is completely bare except for 2 bags of chocolate chips that I swear I’m going to make into cookies one of these days. The secret to this meal plan is in its simplicity. By keeping to whole foods with just a few menu options that freeze beautifully, your prep time for full cooked meals is just a few minutes. Strip Steak, White Rice, Green Beans x 12 meals. Flank Steak, rice, squash x 12 meals. Grilled Chicken (plain), sweet potato, squash x 14 meals. Lemon Chicken, Sweet potato, green beans x 12 meals. Teriyaki Chicken, rice, broccoli x 12 meals. Ground Beef, sweet potato, broccoli x 12 meals. Since this is what we’ll be making, I’m going to explain step by step how to prep this exact menu, but you can make easy substitutions as well. The first purchase we’ll make is the containers for the meals. You’ll need to order these at least a week before you need them. They’ll last you for 2 sessions and are absolutely worth the cost. The containers can be reused or disposed of after use. We reuse the ones at home and Jon throws them out if he takes them to work (because he never, ever remembers to bring them home). In fact, because these can be heated from frozen, he usually just takes a frozen meal straight to work and doesn’t even pack a cooler (since it’s a short trip to the office). You can order the containers here. Be sure to get the one that says “your selection”: the “recommended product” that they show doesn’t have tops. The cost of the containers is included in the $100/week price tag. Speaking of price, our food was purchased at Wegmans in Northern Virginia, so your prices may be a little higher or lower. We didn’t use coupons or sales, so you can likely do a lot better. In fact, we didn’t even use Ibotta since my husband forgot about it! Each meal will have pre portioned-serving sizes, which is so awesome if you use MyFitnessPal to count calories because every single meal has the same calorie count and can be quickly added. Serving sizes: 5 oz meat, ½ cup carbs (rice or potato), ½ cup veggies in each plate. With 74 meals, we can feed 2 adults and 2 children for 2 weeks. The kids (both toddlers) split a meal and have lunches at their preschool program during the week. Usually, my husband finishes up whatever they leave. You can actually add breakfasts to this easily, but choose another day to cook those. I do 20 protein pancake and turkey sausages for the freezer as well, and we have oatmeal and freezer breakfast sandwiches. The cost of these cheap breakfasts fits within in the same $100/week budget. If you’re only feeding yourself, you can eat for 3.5 weeks on this. For price savings, I recommend you consider purchasing these at Costco. Below weights are adjusted for weight lost when cooking. So when you’re all done, you’ll be able to measure out 5 oz of meat. To save both time and money, we bought frozen vegetables in bulk to add to the meals. We were able to buy pre-marinated chicken, but you can also buy a bottle or create your own. $160 (for 2 weeks) + $32 for 74 containers with lids (you need to buy 150 of them at a time since they are only sold in bulk, so we have enough for a month). 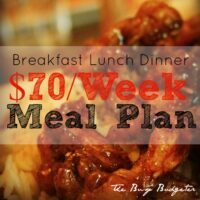 If you really need to save money, that gives you $8 to spend on breakfasts while still keeping in your $100/week budget. Your best bet is oatmeal, cereals, and bananas. This gives you plenty of room to go over and still likely save money from your normal grocery routine. You don’t necessarily need to buy these the first week, but if you end up doing these a few weeks in a row, reinvest your savings into better equipment. Cooling sticks: They help cool the food quickly so it doesn’t heat up your fridge.We’ve been doing this for a while without them, but we plan to buy these for the next batch. Total prep time should be 3 hours. Plan for 4 hours your first time just in case it takes you a little longer to get the hang of. If you have an electric griddle, fire it up. If not, heat a frying pan and preheat the oven to 350. Brown the sides of the steaks, then place them in baking dishes and bake in the oven (with the meat thermometer set to alarm when it hits the right temperature). As the steaks get close to finishing, start the chicken, browning on the griddle and then baking to temperature. As meats finish in the oven, they get moved to a large bowl to cool for a few minutes and then straight into the fridge to completely cool. As the last of the meat goes into the oven to cook, make the rice and sweet potatoes. We cube the sweet potatoes and boil, but you can also mash them. By the time your last meat is ready to go into the fridge, your starches are done and the first of the meat is cooled. Grab your cutting board, and dice the meat up into small bites (you shouldn’t need a knife to eat these meals- each piece should be bite sized). Lay out your containers (so 12 containers for strip steak – refer to the guide above to get the numbers right) and measure out your meat. You can use the food scale to get exactly 5 oz each or you can just equally divide them if you don’t have a food scale. Then use a ½ cup measuring cup to portion out the carbs (Jon sprays a bit of cooking oil on the measuring cup so the rice doesn't stick), and finally add a ½ cup of veggies (it helps if you have two ½ cup measuring cups). Stick the tops on and move them to the fridge. Keep going until all of the meals are frozen or in the fridge. We keep 2 days worth of meals in the fridge at a time and then move new meals to the fridge every day. We have a small deep freezer (the cheap $150 ones) and a normal freezer, and 74 meals take almost all of our freezer space. The only downside is that eventually, you’ll get sick of having the same meals over and over. We’re on a month and a half and still haven’t hit that yet, but I’m sure it’s coming. It’s so nice not to have to cook at all, though. We’ll start adding in our favorite freezer meals from $5 dinners once we start getting sick of eating the same thing. But this has been an awesome boost for our waists and our wallets! P.S. If you’re ready to finally get your house under control, you can sign up for our FREE Home Rescue Challenge and we’ll walk you through the 3 simple routines that will change everything about the way you manage your home routines. This is an absolute time saver idea ! Love it ! Thank you ! 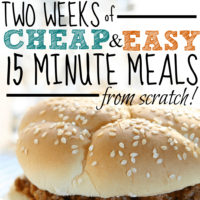 The Busy Budgeter recently posted…The Ultimate 15 Minute Chili. I love this. I never thought about freezing meals in portions! Genius. This is so helpful! I’ve done some meal prep before, but was wanting to get back into it to save some time and money. Thanks for sharing! Saving time and money is my mission in life 🙂 So glad this was helpful! What a great concept! I love the individual meal portions! Wow! 74 meals. That’s quite an accomplishment. I just invested in a new freezer so I wouldn’t be limited to how many freezer meals I could make at one time. One tip I’ve found helpful is to include a label with the date the meal was frozen, what still needs to be done, and what other items (sides, salad, bread, etc.) will go with the meal. Great tip! It takes the guess work out 🙂 Love this. I’m Pinning this so I can ‘study’ it. 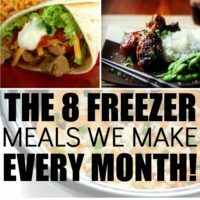 We love all the food on your menu and I’m thrilled to finally find a freezer plan we could actually use. Thanks for sharing at Merry Monday. How is this healthy? When is .5 cups of veggies good for you? Your kids are getting what? Max of 3 veggies. Cost efficient sure. Healthy? No. Nice click bait. it is a great idea however, no way is that enough veg per day. Protein maybe because you are having protein in the morning and afternoon I would assume. If I am wrong please correct me. Also wondering if that’s too many carbs.. Reminds me of parties I used to go to where we did something similar to this. It’s so nice to be able to pull out prepared foods that are delicious and good for you. I love this! And you broke everything down so well- such a great post! You listed green beans and squash on the list of ingredients but you didnt say how it was used. how do you cook the beef, do you ground it up or leave it like a burger? IF you don’t have the containers what else can you use or are you still able to do the meal plan? How do you reheat the meals? Do you just microwave them? Don’t they get a little dry or tough? I really like the idea of freezer meals but my family usually hates leftovers and most of these meals seem like they wouldn’t have that freshly cooked taste. That’s great but where are the recipes for the different dishes? Great plan! Would love to know how to reheat these meals in the oven, we don’t use microwaves. Thanks!